I came across the second series of Batman Unlimited figures this week at the local Target, where they run $16 each. This wave consists of the very cool Dark Knight Returns Batman (apropos with the new two part film just finished up) and the cool only to the true Bat-geek Planet X Batman. 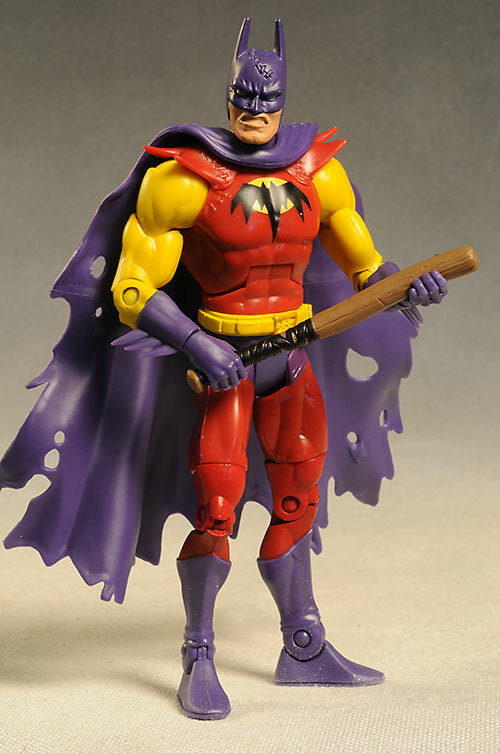 The latter comes with a Bat-Mite figure as well. We should also be seeing the second series of DC Unlimited figures with these, including a New 52 Wonder Woman and an Injustice Batman. As I said, these run around $16 at Target, pretty much the going rate these days for any figure in that 6 - 8" range. Obviously it's too early for the packaging to change, and the attractive graphics do pop on the peg. There's quite a bit of waste - it's much larger than it needs to be for most of these figures, with the exception of the Bat-Mite/Planet X pair up - but that's a minor nit to be sure. I will say that if I was a MOCer and planned on storing these, I'd be annoyed by how much space they take up. My son and I just finished up the two part film that introduced him to the Dark Knight Returns story line, so it's fitting that I found this figure on the pegs. They've done a terrific job translating the look into this DCUC style of figure. The sculpt is instantly recognizable, and yet he can fit right along side the past DCUC figures with ease. I'm not as thrilled about the Planet X Batman, simply because I'm not a big fan of the rather goofy story - both the 1950's version and the more modern Morrison tale. Even if I did love the story, the slightly over sized head just doesn't fit on the shoulders properly. The slight pock mark texturing to the face isn't working for me either, and this bobble-head appearance adds a goofiness to a figure that already has plenty of goofiness to go around. All three fit in with the other DC Unlimited and DC Universe Classics in scale, standing about 6 3/4" tall. 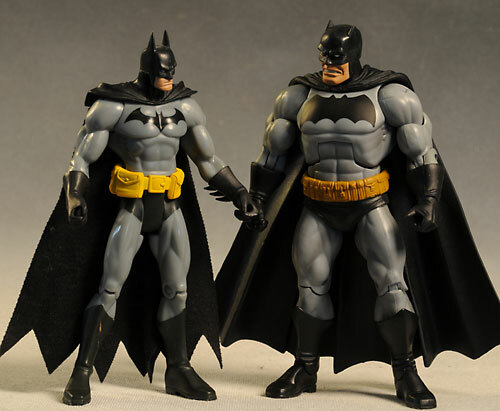 They stand great on their own, and the hands on both Batmen are sculpted to work properly with the accessories. The paint is very good across all three, with some nice details and some very good cut lines between colors. 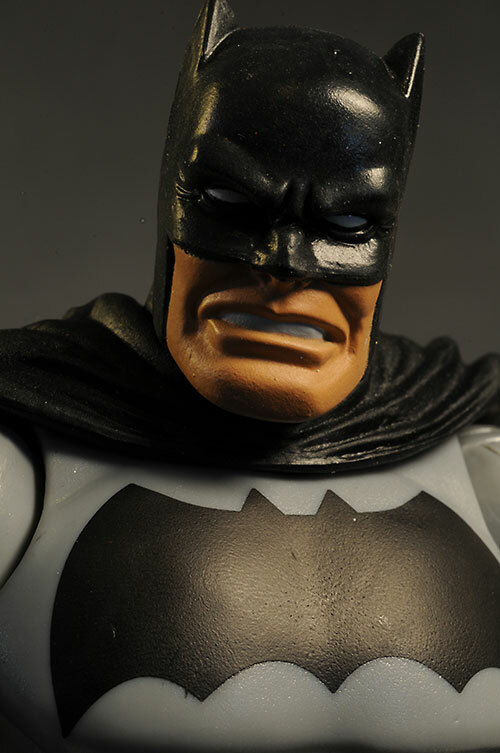 The DKR Batman has the least amount of detail, but the eyes and mouth are clean, as is the terrific huge bat symbol on his chest. The funky colors on Planet X are certainly eye catching, although they may not be your cup of tea. As I said in the previous section, this is really a figure for fans with an appreciation for the kitchsy old school concept. He takes a hit here because of some real slop o his teeth, and because the stitching on the cowl and suit are the same color as the cloth, making them blend in and look toy-ish. It's not all bad - at least his cell phone...er, 'Bat radio'...has it's own color. 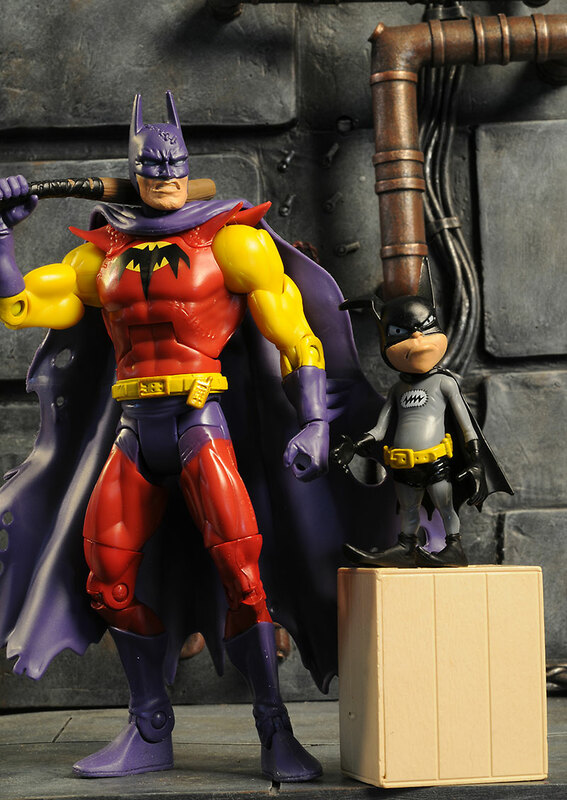 The Bat-Mite is the smallest of course, making any paint work the hardest to pull off. I love the tampo emblem, and even the slightly googly eyes work perfectly for this character. 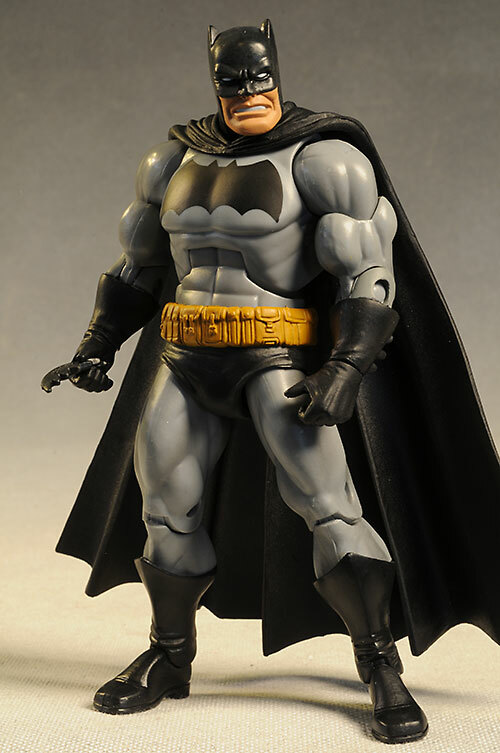 The Planet X Batman has all the articulation you expect from any standard DCUC style figure - ball neck, ball shoulders, pin elbows and knees, cut wrists, pin ankles, cut waist, ab crunch, cut thighs and biceps, and the cool hinge style hips. They all work good, and allow for plenty of poses. The DKR Batman has all the same joints (the hips are a slightly different design but still work well), but his bulk makes him slightly less poseable. Still, you can get some great stances, and by using the ball neck and ab crunch, mimic his look from the book and movie to some extent. 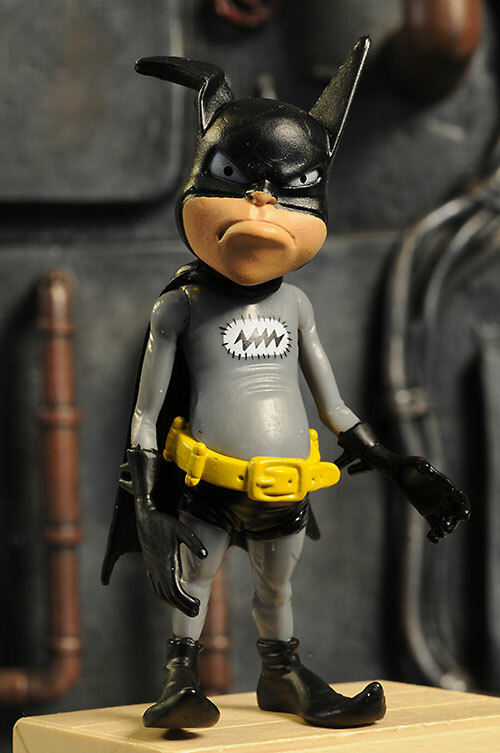 Bat-Mite isn't as articulated, but that's probably not much of a surprise. There's a ball neck, cut shoulders and V hips. He can stand great on his own, but that's about it. While it might appear that Planet X Batman is losing the battle overall, this category is where he really steps it up. DKR Bats has his one accessory - a large batarang. It's nice, and it fits fine in either hand, but that's still not much. 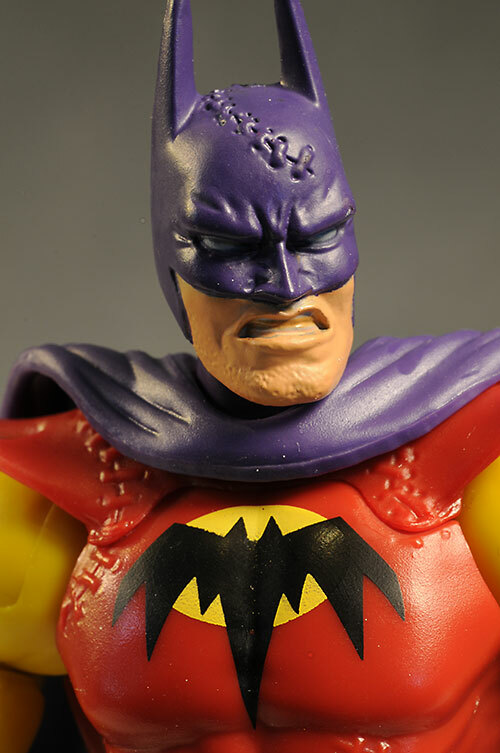 The Planet X Batman comes with two accessories, and they both fit right in with his character. If you read the old story, you know he used a trusty baseball bat (how cute - a bat for a bat), and the figure has a properly scaled slugger. The plastic they used is a bit too soft, causing it to deform in the package and probably wilt in his hands long term, but at least he has one. Then there's his second accessory - the very cool Bat-Mite! Having one in this scale is great, and it makes sense with this character. He has visions of Bat-Mite in the story, so including him was a very nice touch. These are terrific toys, with good build quality and the ability to easily stand up to real play. With the new two part film out on blu-ray based on the Frank Miller story, more kids may know who the DKR Bats is (I know my son does), making him an even better addition to their arsenal. These will cost you around $16, but both of them have something extra going for them that makes the price a bit less painful. 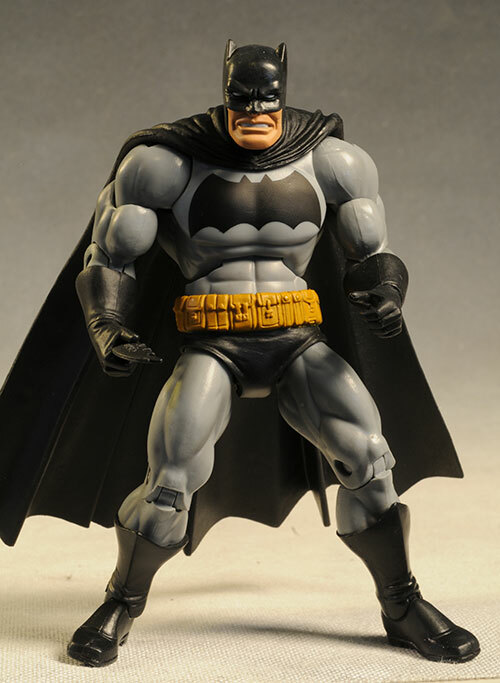 The DKR Batman is a big boy - ad he should be. There's a lot of mass here, and a lot of plastic. There's only one accessory, but with the extra bulk I'm giving him an average value score. 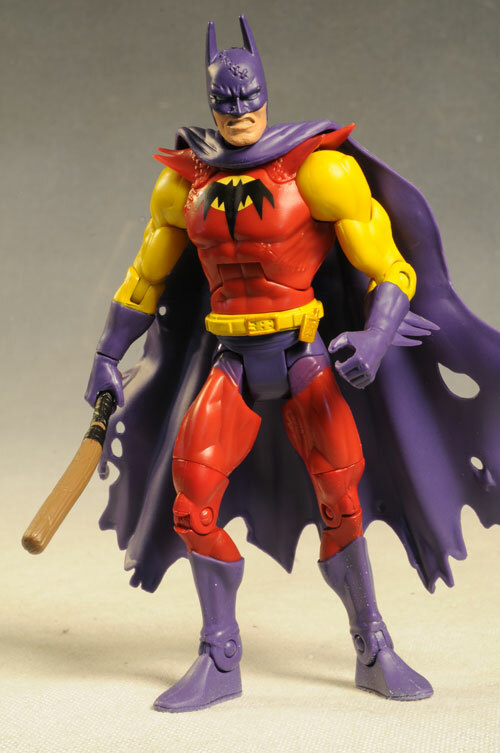 The Planet X Batman is the fairly standard body size, but not only does he have his baseball bat, but eh has a whole second figure in the Bat-Mite. For the same price as any other figure in the line, that's a solid buy. 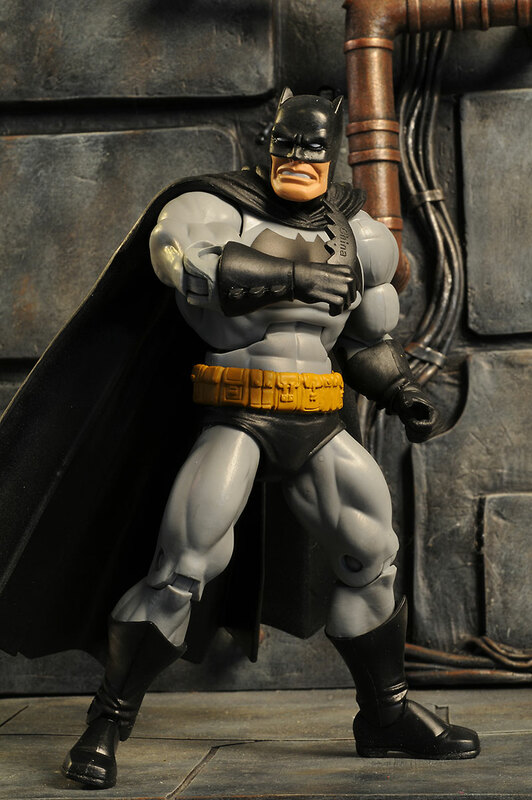 I really, really like the DKR Batman, and he's a must buy for the big Batman (and DCUC) fan. He's not quite perfect, but it's awfully close. Bat-mite is really sweet too, and for me he's the big selling point for the Planet X Batman. Without him, that figure would only pull a **1/2 overall, but throw him in the mix and you get a very different result. I picked these up at Target, and they seem to be the first to be getting them. Expect to pay around $16. 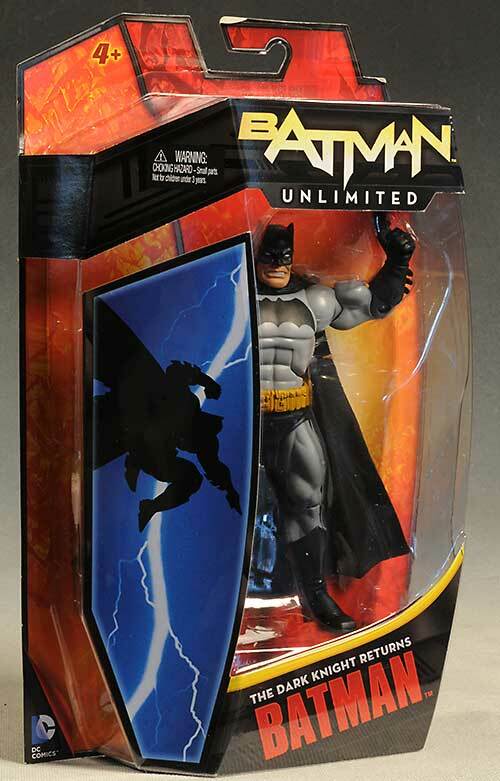 I covered the Batman/DC Unlimited series 1 figures here, I've reviewed a ton of DC Universe Classics, but instead I'll point you to the last one - Series 20 - and you can check out the 'Related Links' section there to find the others.